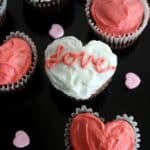 Valentine Heart Cupcakes are made using a standard muffin pan and a small marble. 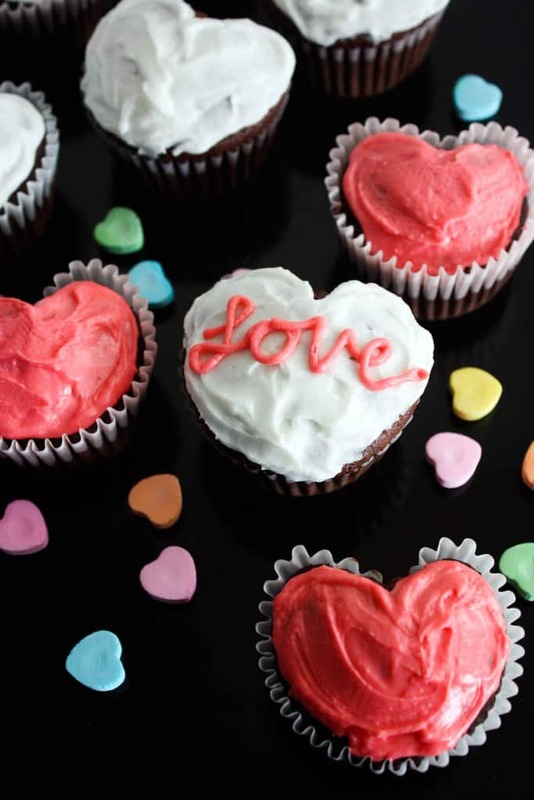 Your kids will love making and decorating this simple, fun Valentine’s Day treat! Aren’t these little heart cupcakes the CUTEST? My mom taught me this little trick–it’s genius and SO easy! I found a bag or marbles at the dollar store and whipped these together so quickly. They’re the perfect Valentine’s Day treat! You can also use a frosting tip to write on the cupcakes (see the picture below). This is a fun idea if you are taking the cupcakes to a party. My kids had a blast helping me make these. I also love Valentine candy, so I used these cupcakes as an excuse to buy some Valentine heart candies and I sprinkled them around the tray. The biggest trick to these cupcakes is to make sure not to fill the cupcake batter too full! If there is too much batter, they won’t bake into a heart shape. Only fill them 1/2 full. Make homemade cupcakes or use a doctored-up cake mix. If you want to save time, you can doctor-up a cake mix by using milk instead of water and adding one extra egg to the batter. I also love this homemade chocolate cupcake recipe and these homemade red velvet cupcakes. 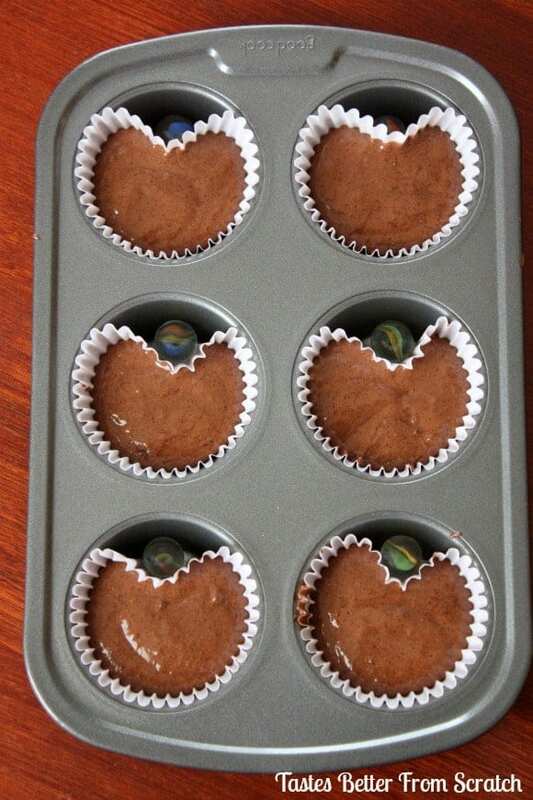 When you are pouring the batter, be careful not to fill the cupcake liners more than 1/2 way full. If you do, they will lose their heart shape as they bake. 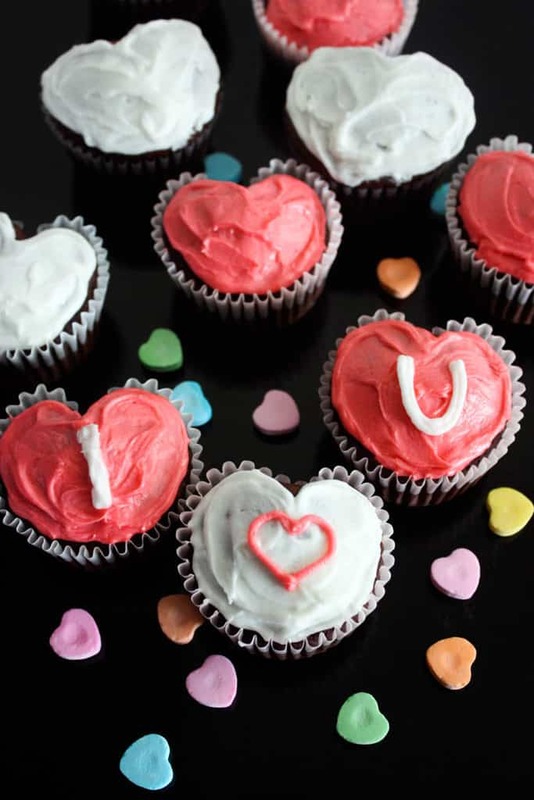 Valentine Heart Cupcakes are made using a standard muffin pan and a small marble. Your kids will love making and decorating this simple, fun Valentine's Day treat! Make cupcakes according to recipe directions. After filling the liners, place a marble between the liner and the pan. You will see the cupcake take the shape of a heart! Bake cupcakes according to recipe directions. Allow to cool completely before frosting. These are so cute! May be a silly question but do I remove the marbles before baking? And, if u work fast, u can drop the marble in ice water and make a “crackle” marble! I haven’t done it myself, so Google or Pinterest instructions, but it’s easy enough! Fun! I may try it w the pink or red heart shape magnets from Dollar Tree! I meant heart shaped Marbles, NOT magnets! Love this, they look so cute!